As on board civilian teacher (math, English, reading, and photography), Paul Genin spent most of the years 1981-1991 at sea with the US Navy. However, as Subic Bay was the Navy's largest ship repair facility, much his time was spent in Subic Bay, For the latter two years he most of his time was in Subic Bay, Republic of the Philippines. After the first few times in this port-of-call, Paul vowed to photograph this place as much as he could. Subic Bay's nightlife and red-light districts frequented by sailors, civilian workers, and some tourists consisted of three areas: Downtown Olonapo City, directly across a river from the naval base, its main drag Magsaysay Drive. The next area, a jeep ride of about fifteen minutes away was the Barrio Barretto, an area of bars, hotels, and restaurants directly on the beach. Finally, there was "Subic City," or, technically, Calapandayan, an altogether different municipality. The bars there were often smaller, were not go-go bars as in town and in the Barrio, and their specialty was "short time." 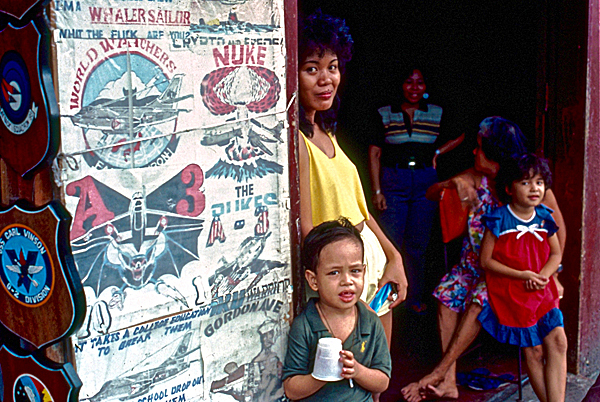 In 1991 the Philippine Senate decided not to renew the bases treaty with the US and the large naval station, the sprawling Clark Air Base, and a few smaller US Military facilities shut down the next year. The photographs included here are a selection of images from a larger body of work in the Subic Bay area. In June 1991 the largest volcanic eruption of the 20th Century, Mt. Pinatubo, in a nearby province effectively ended Paul's employment (teaching, US sailors and Marines and Filipino nationals on the US Naval Station). Paul Genin first started his avocation by studying the work of the Farm Security Administration and Richard Avedon. As the years passed Paul photographed in Louisville, Upstate New York (where for one year he attended the Apeiron Photographic Workshops), Texas, and, eventually beginning in 1981 in Subic Bay, the Philippines, just outside of the sprawling but now dismantled, US Naval Station. The photographs shown here come from this time period.